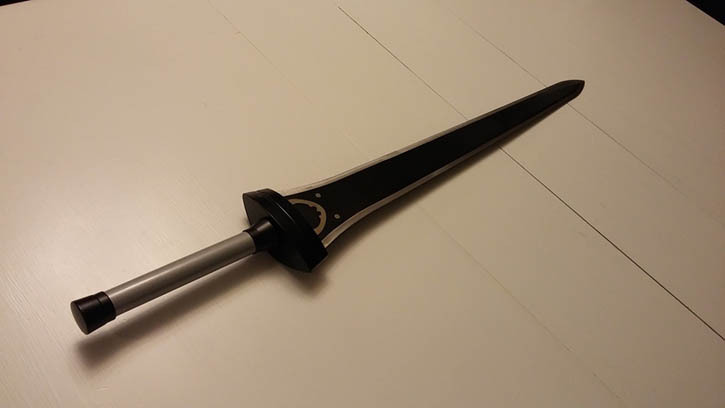 The sword of Kirito from Sword Art Online may not be based on any historical sword that ever existed, but that does not mean that it is not a cool looking decorative sword. But in this hands on review, we take a look at it from the perspective of an experienced collector of fully functional swords, and see exactly what you can expect for under $60.. Surprise! The inability to Log Out is not a bug, it’s a feature! Also included in this feature are: terror, angst, and the possibility of real death if you die in the game thanks to a lethal hidden upgrade in the Fulldive helmet. 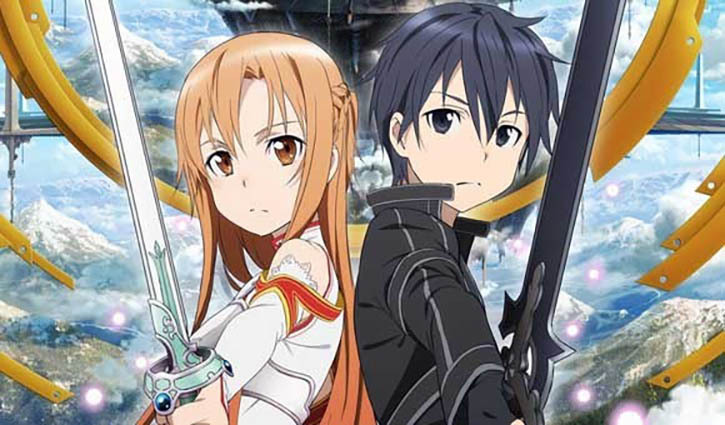 The 10,000 players in Sword Art Online are now trapped and fighting for their lives – the only escape is for all 100 levels of the game to be cleared. I know. Cheesy, right? One part action, one part romance, one part otaku wish-fulfillment fantasy, SAO exploded into popularity in 2012. Despite its formulaic shonen anime plot, SAO was a massive hit. It didn’t resonate with the hard-core anime fans (anime snobs?) so much, but casual fans and even newcomers to the genre were captivated. And speaking as a fan who has seen a not-inconsiderable amount of anime in my day, I can see why people loved it. SAO managed to take a pile of standard anime tropes and turn them into something that was more than the sum of its parts. Yes, it is somewhat predictable. Yes, the protagonist is the usual teenage powerhouse. Yes, there are clichés. But when well executed even a show that is as generic as SAO appears to be can capture imaginations and create fans all over the world. Heck, even my wife liked it! The sword that we are reviewing today is one wielded by Kirito in the second half of the first season. 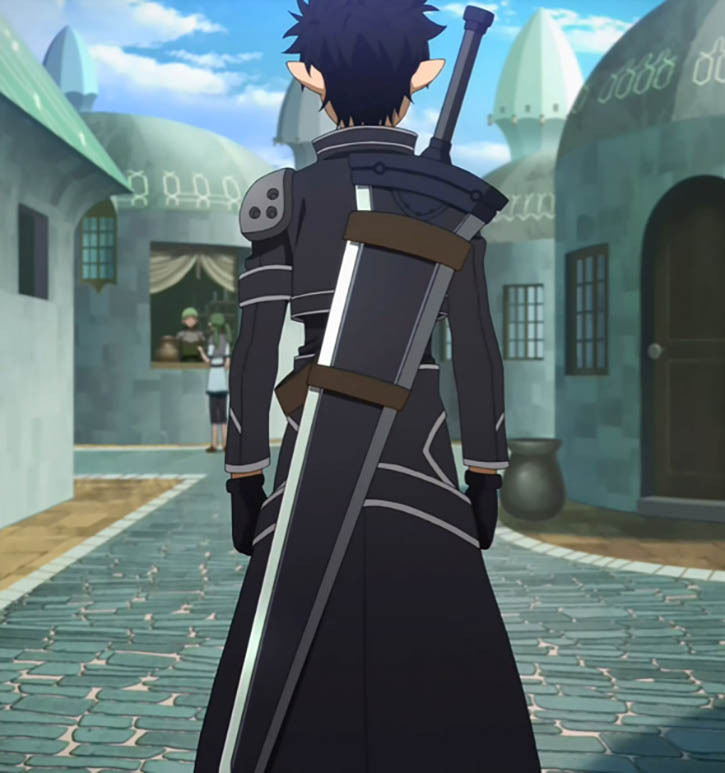 While unnamed, it is typically referred to as “Kirito’s Black Great Sword.” While enormous, due to the incredible strength of Kirito’s online Avatar he can wield it with one hand. Without giving any spoilers, it is used in some incredible battles with high stakes. Kirito is a monster with this sword – you know it, he knows it, and his unfortunate enemies especially know it. I was struck upon my first glimpse of the sword by its size – that is, it was definitely smaller than the sword in the anime. Not that this is a bad thing of course, as the the “real” version would be about five feet long. Despite the size difference from the anime the sword has a grand feel about it, and looks pretty impressive in person. Let’s take a look at the individual components. 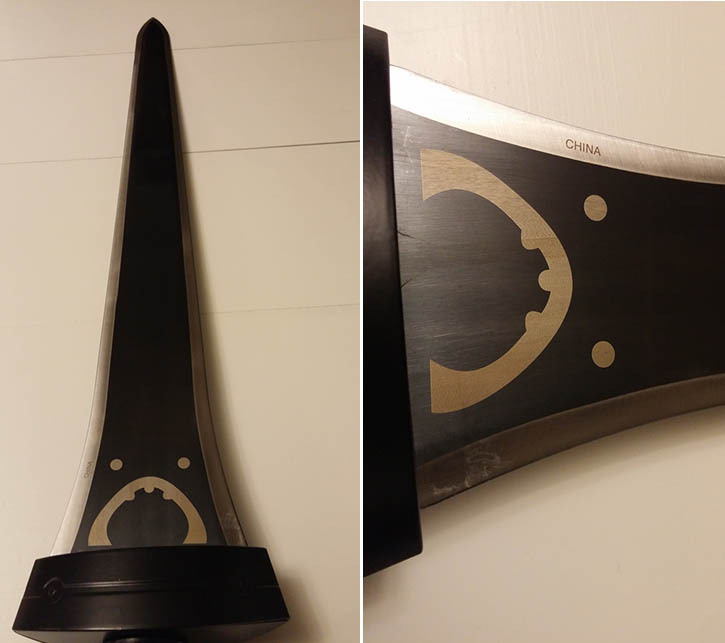 The black paint is evenly coating the blade and the bronze accents are crisp and eye catching. 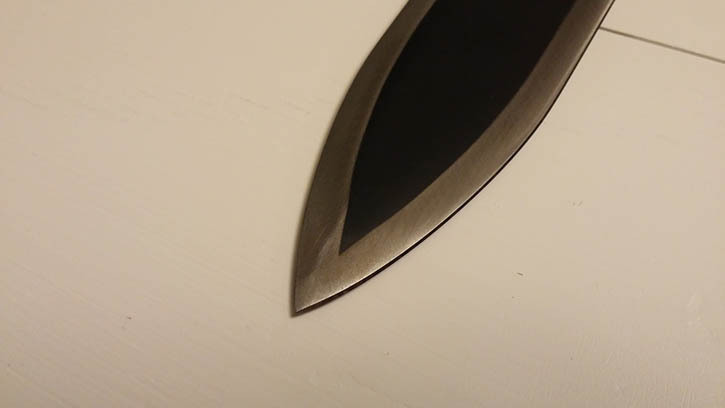 I actually quite like the design even though it is flashy – the silver “sharpened” edge (it’s quite blunt) is pretty attractive. It’s also quite robust - I have no doubt that if sharpened the blade could do a quite a bit of damage to a target. Would the sword itself survive, though? The handle of the Black Majesty feels like a large wooden dowel, which is probably because that’s what it is. 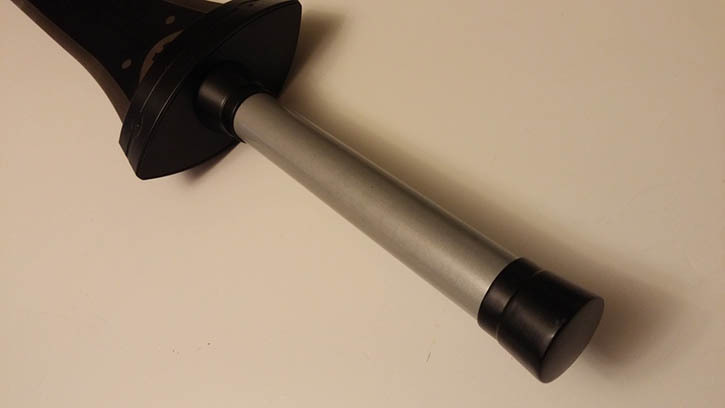 No two ways about it – it’s a very simple handle, painted silver, and no visible marks from a lathe. The paint is quite smooth so if you used the sword for any length of time you should really be watching out for sweaty hands – I’d hate to be in the way when this one goes flying. 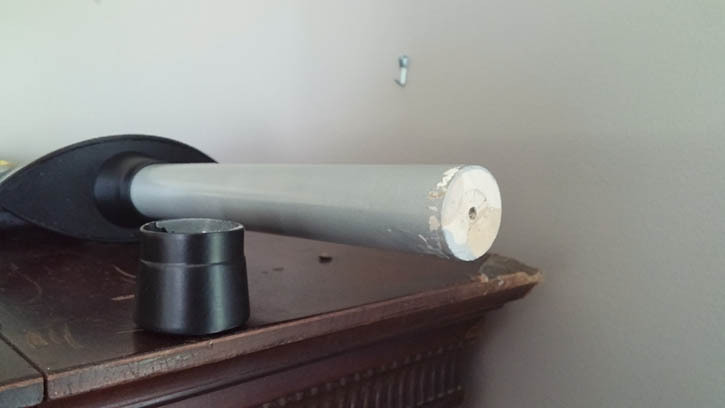 When the sword arrived the metal cap on the end of the handle was loose, so on a whim I pried it off. What was visible underneath the cap was just the end of the wood. 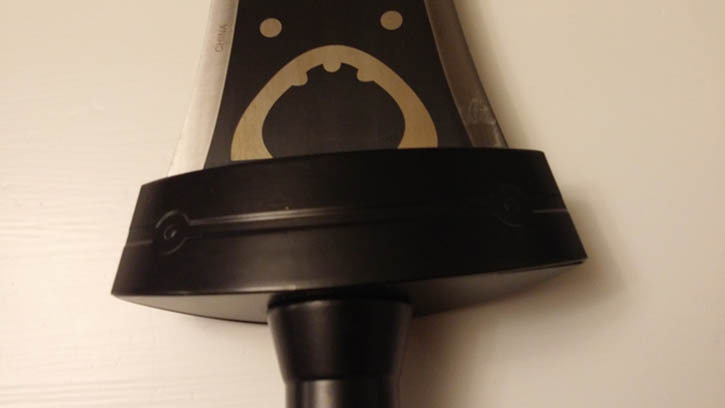 No tang, nothing visible to give any indication of how the blade and tang were attached. 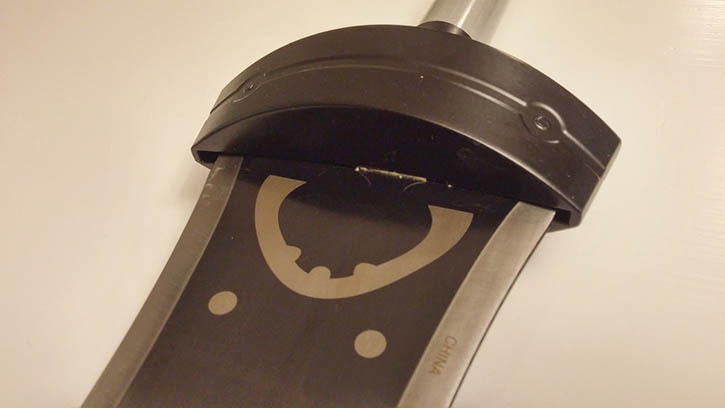 I figured after some work that I would be able to get the handle off, but it would destroy the sword in the process. Not wanting to do that I simply epoxied the cap back on. The guard appears to be painted, cast metal. It looks huge but least it’s not plastic! I’ll be honest – not great. If you were using this one handed as Kirito does in the anime you wouldn’t have a very good time. At almost 5 lbs and a POB of 7.5” it is well outside what most normal swords would be like. The handle is only 9” so some people would be hard pressed to get larger hands on it for a two-handed grip. Still – it feels impressive. There isn’t a hint of a wobble from the blade when you swing it, it’s nice and stiff. 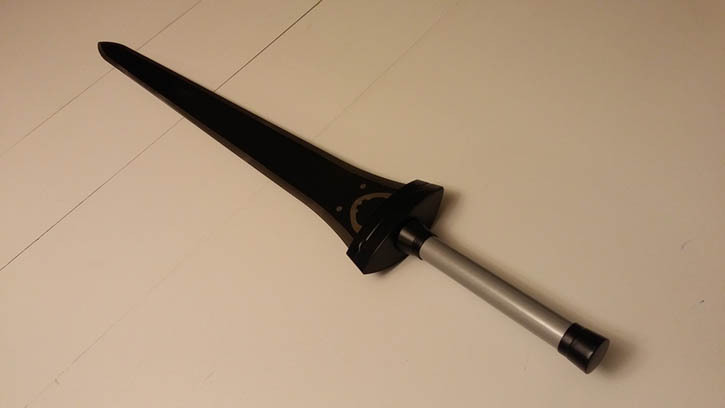 You definitely get the feel of a powerful sword when you swing it, though without looking at the (probably welded) tang I would really hesitate to label this as “Battle Ready.” I have a feeling that it would fall apart if used as a cutting weapon. Surprisingly, the sheath and back strap work really well. 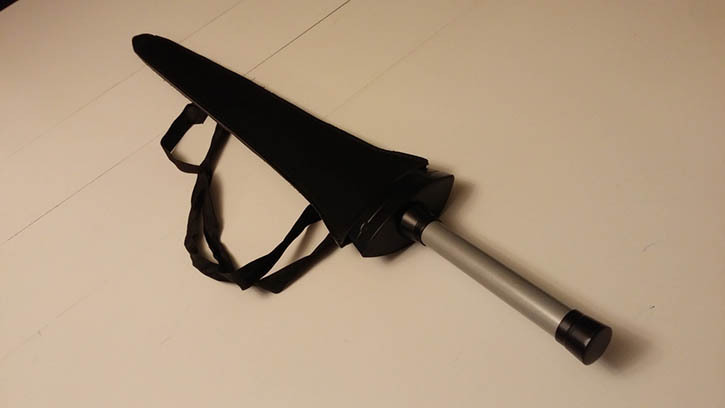 The sheath is a pretty plain, leather affair, and it’s a bit too long so the end so it tends to get bent. 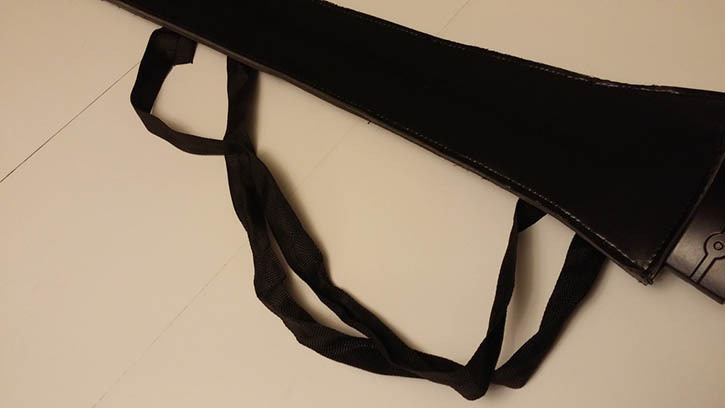 But the back strap itself is tight and keeps the sword comfortably on your back. It’s actually more comfortable and more stable than some of the more expensive back straps I’ve owned – the sword sits properly at the shoulder and doesn’t slide around a lot. If you were buying this for use on the cosplay circuit it would probably stay on your back for a full day of Comicon-ing without falling down. You really can’t judge this sword based on how real swords are built and function. Because it is based on a sword from an imaginary world where swords can be the size of small vehicles and no one bats an eye, you have to judge it on how closely it resembles that imaginary weapon. And despite the difference in size – it’s a pretty darn good replica. Traditionalists might raise an eyebrow, and I really wouldn’t recommend cutting with this – but overall, for the price it isn’t a bad piece. 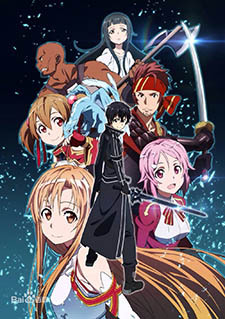 Fans of SAO will probably get a big kick out of it, non-fans might not so much… although if you aren’t a fan of SAO, you should watch a few episodes! At the end of the day, I enjoy this sword for what it is, wallhanger though it may be. Sword collecting is a hobby, and there’s more than enough room for anime swords alongside “real” swords… except perhaps if your sword wall is getting too full!